Anthony Di Franco is something of a prodigious talent. While still at school and years before he became a member of Skullflower or Ramleh, Anthony Di Franco was recording as Ethnic Acid and JFK. The results of those bedroom recording experiments found their way onto the Broken Flag discography. While his contributions to Broken Flag were cassette only, JFK made vinyl appearances on the Fourth Dimension label - one track appeared on the Tearing Down The Barricades compilation while 'Temple of Set'/'Sexodus' was released as a single - both of which I've got somewhere. Last year Harbinger Sounds and Hospital Productions released the Teenage Fantasy 1987-1988 retrospective double album of the early JFK non-Broken Flag cassette releases. From 1987 onwards Di Franco handled bass duties for Skullflower contributing to releases up until 1993, around the same point Ax started recording for the Freek Records label - a label which in its short 3-year life span issued recordings from Skullflower, Consumer Electronics, Bodychoke as well as the varied solo manifestations of their members. Ax only ever recorded for the Freek Records label and Metal Forest dips into those releases compiling tracks from their three releases. Metal Forest isn't his first release for Cold Spring though. Aside from Ethnic Acid and Velvet Snakeskin Orchestra contributions to Cold Spring compilations, in 1999 Cold Spring released the CD album New Rising Sun from Novatron, the sole release from Di Franco's short lived project with Kevin Laska. Metal Forest dips into his Freek Label releases compiling tracks from Nova Feedback, Ax II and Astronomy. 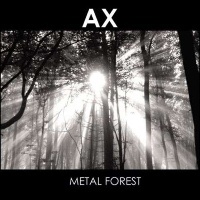 Dispensing with any chronological order Metal Forest kicks off with 'Kortex' the sole contribution culled from Astronomy, the final Ax release. It's a strong opener with pummelling distorted throbs over hiss, generating atmospheric noise with a slow build up of fuzzy bass tones. The rhythms dissipate for 'Nova Feedback 1' as it unwinds to waves of shape-shifting noise and blackened textures. It cuts to the harsher, analogue synth wizardry of 'Heavy Fluid'. With vibrating, hums of low end tones and occasional blast of guitar atmospherics shot through with sporadic feedback squeals and jolts of percussive clatter it's a bit of a slow-burning monster. You can even hear the influence of Skullflower seeping in. 'Theme One', on the other hand, is a blistering wall of shredded psych noise. While 'Theme One's is dense and abrasive, 'Metal Forest' opts for something much more cavernous, with its washes of guitar destruction. With scraping guitar distortion, wrestling with reverbed analogue electronics of the dark ambient type it sounds like a collision between Skullflower and Lustmord. The first of the Ax II tracks offer something harsher with wavering tones wrestling with frequency shrieks, which at points are almost like sci-fi effects. Underneath lurks abrasive engine-like noise. Just as the careering waves are more akin to the atmospheric psych noise drift of C.C.C.C., the second cut from Ax II resembles a noisier Lustmord, with a scorching blackened hum caught in a blizzard of atmo-noise. The second cut from Nova Feedback, 'Nova Feedback 2', clutches at the tail end of feedback vapour trails, while the careering guitar emissions are sucked forward and repeated into something sounding like a soundtrack to a b-movie sci-fi flick. The final track, 'Cluster' arrives fully formed as a buzzing static drone. There's less variation here as it obsesses on a meditating riff, its buzzing chords recalling a more focussed Skullflower, maybe. It's one that certainly hits the spot anyway.